This is a top of the range custom generic ‘Record’ frame built on Nervex Pro lugs and bottom bracket. 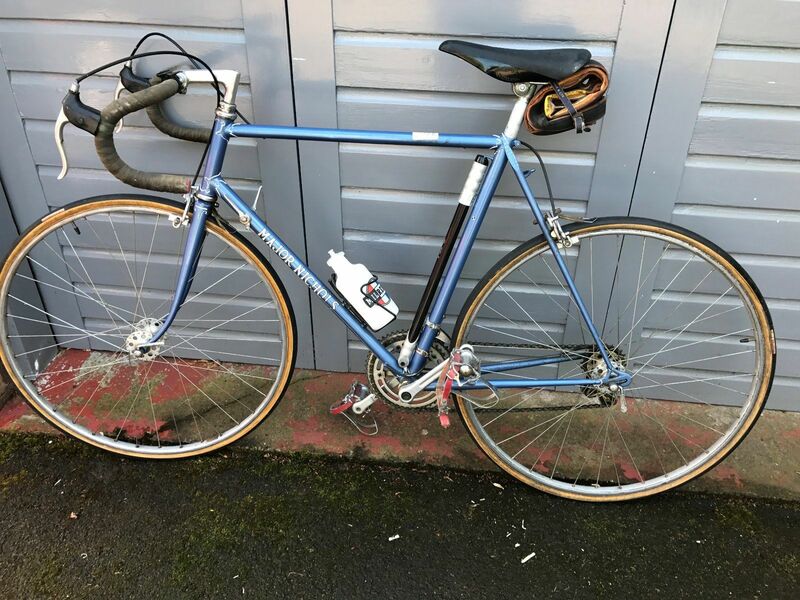 As yet we have no frame number and my guess is mid to late 60’s There is a curved reinforced brake bridge and curved chainstay bridge and full wrapover seatstays. The fork blades are moving towards the later sickle shape and are set in a flat topped Vagner No 11 fork crown, a much less common option in the parts box. There looks to be less fork relief than normal too suggesting a full race / TT pedigree. 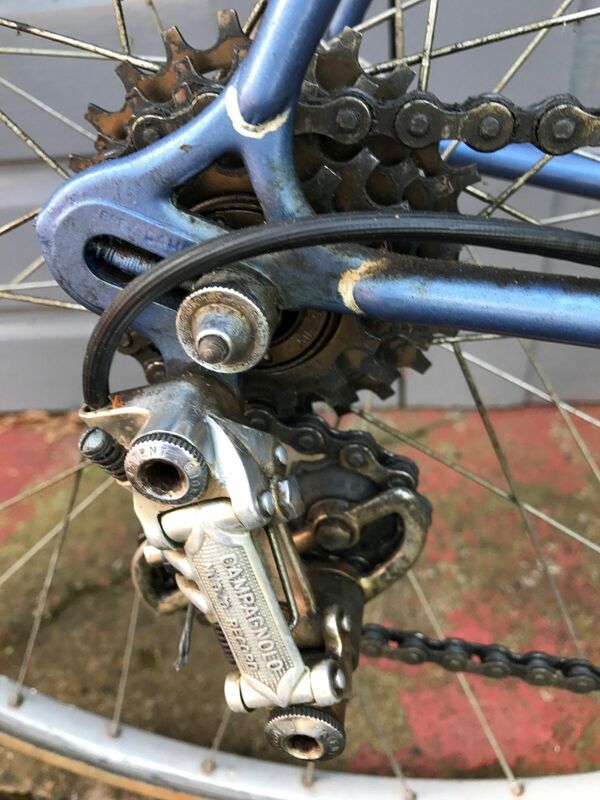 Other than the two derailleur bosses, D/T bottle bosses and the single D/T pump peg, there are only front and rear derailleur stops and rear brake stops at 5 o’clock. The head and most of the seat tube transfers have gone but the down tube white black edge gothic script looks good and the flam blue, probably original finish, looks good too. Lug lining is in white and gold and is a bit scruffy so may have been added later together with the white spotted outline on the top eyes of the wrapover. A new one to me! Nicely equipped with Campagnolo chainset, pedals, seatpin and Nuovo Record derailleurs. The sprint wheels have Campagnolo Large Flange hubs. Brakes are Universals and a nice Mavic stem. The Milremo Gran Carrera pump is a tasty and uncommon accessory. We hope the new owner will contact us as we would like a frame number if possible. There will be a number on the steerer tube to be found if the forks are dropped out. These will normally replicate the numbers on the BB if any. 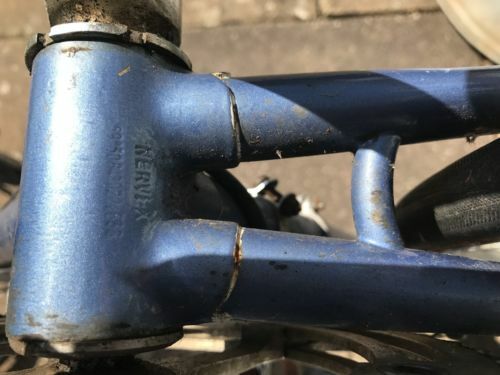 I have a clue in the use of Nervex Pro lugs and the frame colour that it may be a 1967 but we need confirmation. MN 1960.s Hand built bespoke Major Nichols racing bike. Canpagnolo gears,chainset,pedals,hubs and seat column. Mavic extension, Universal brakes, Gran Carrera pump. 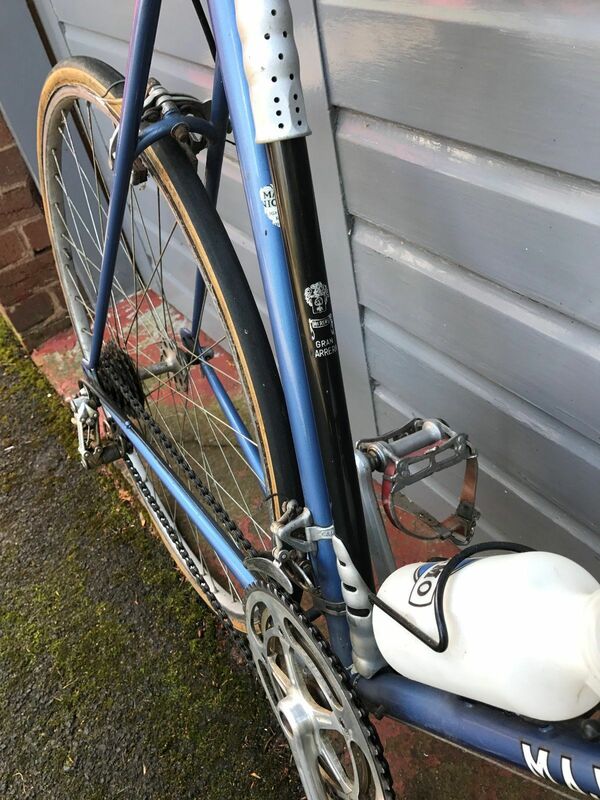 Tubular tyres on sprint alloy rims with spare tyre. 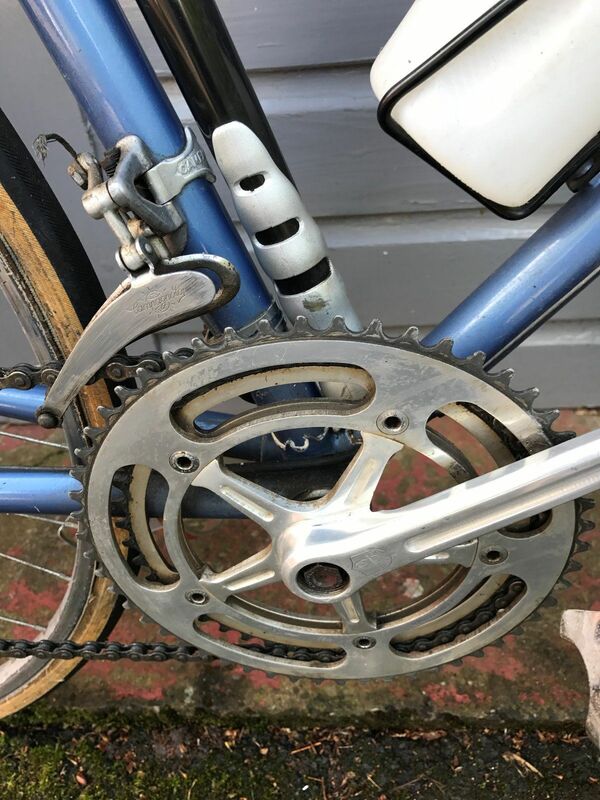 Comes with additional Campagnolo seat column, additional close ratio time trialing 5 speed gear block, gear extractor,chain rivet remover and Dunlop tubular tyre repair kit. A rare opportunity to buy a genuine 1960’s hand built thoroughbred including top class equipment. 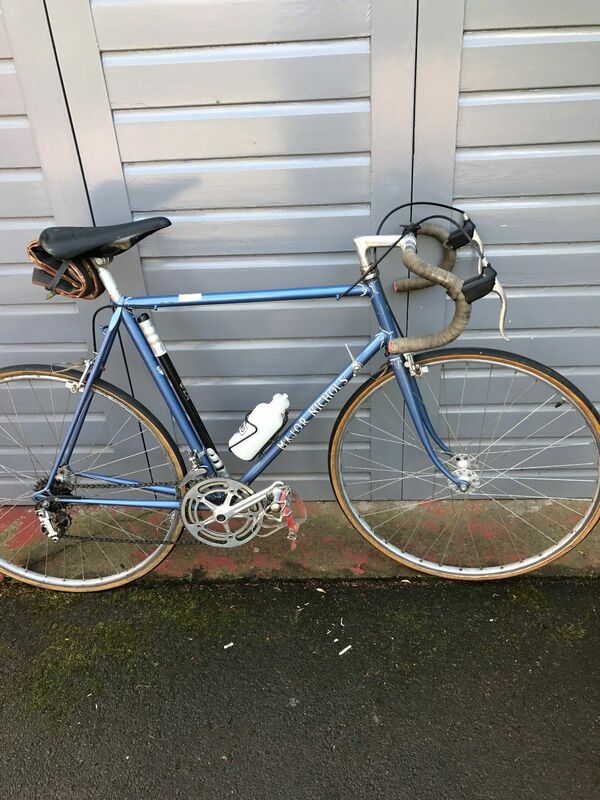 Used as a triathlon bike but now retired.